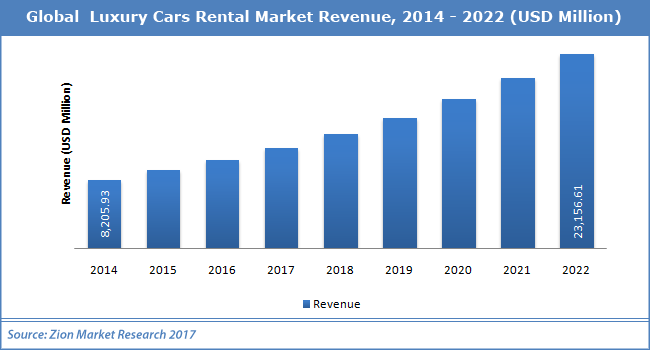 Prominent companies of the luxury cars rental market comprises Sixt Rent-A-Car, Avis Budget Group, Inc., The Hertz Corporation, Enterprise Rent-A-Car, Al-Futtaim Group, Europcar, Localiza Rent A Car, Carzonrent, and Eco Rent A Car among others. These players are set to bolster the global luxury cars rental market. As per report by Zion Market Research, the Global luxury cars rental market added up for almost USD 8.2 Billion in 2014. The luxury cars rental market is expected to cross the USD 23.2 Billion by end of 2022, developing at a CAGR of almost 14.0% from 2017 to 2022. Most car rental players provide a plethora of vehicle sizes to suit a diversity of space and budgets needs. This service is the major reason for the development of luxury cars rental market. Some suppliers additionally provide specialized vehicles to go well with its location such as prestige models, convertibles, SUVs, hybrid/electric vehicles, and passenger vans, thereby powering the luxury cars rental market. The technological advancements such as Internet website permitting online reservations and various mobile apps allow consumers to save their money as well as time, powering the development of luxury cars rental market. Various government initiatives in support of luxury cars rental market are claimed to boost the market. For example, in January 2018 North Carolina made decision to invest $13.8 Million on charging infrastructure from a deal with Volkswagen for making unlawfully-polluting vehicles, powering the luxury cars rental market. Compact luxury cars division is likely to rule the luxury cars rental market in the years to come among other luxury car type divisions comprising full-size luxury cars, midsize luxury cars, luxury SUVs, and luxury crossovers & minivans. Compact luxury cars division is likely to branch out at a relatively high development rate of 14.2% in the years to come. Airport transport division is likely to add up for comparatively high share in the luxury cars rental market with a noteworthy development rate of 14.4% in the years to come. Others divisions of the luxury cars rental market by end-users comprise outstation, local usage, and others. Online division is likely to branch out at a comparatively high CAGR in the luxury cars rental market over the forecast period. This is due to rising trend of e-commerce all over the world. Online division is likely to add up for 70.2% by end of 2022. Luxury cars rental market in Asia Pacific is likely to branch out at a relatively high development rate in the years to come. On the other hand, luxury cars rental market in North America is likely to rule the global luxury cars rental market with 46.7% income share by end of 2022.